Hilda Ericsson and her husband co-founded the global company L.M. Ericsson. Hilda Ericsson was born in Stockholm in 1860. She was the only child of court saddler Peter Simon Simonsson and Carolina Margaretha Nilsson. She was only 17 years old when she met Lars Magnus Ericsson, an engineer who was 14 years her senior. He had been called to the Simonsson family home in order to fix Hilda Ericsson’s father’s organ. One year later Hilda and Lars married and very soon afterwards their first child was born. Between the years of 1879 and 1892 Hilda Ericsson gave birth to four children. This did not prevent her and her husband from developing the company L.M. Ericsson & Co. Mekaniska Verkstad (mechanical workshop). During the first year of business, 1877, they brought in six telephones – which at the time were technological innovations – for repairs. 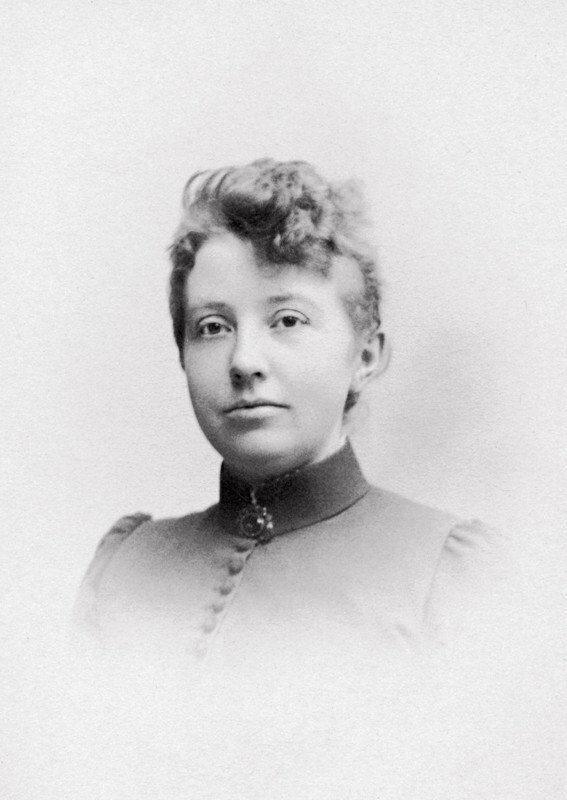 Hilda Ericsson, who had attended school for a longer period than her husband, was initially responsible for the company books, but she also put her hand to repairs and the development of Ericsson’s telephones. She was also responsible for all customer relations and contacts with suppliers. Further, she also undertook all the childcare whilst also serving as a sounding board for her husband regarding the running and development of their company. By 1881, only four years after being founded, the company had expanded so rapidly that larger premises had to be found and more machines acquired, as well as 30 employees hired. Ten of these individuals were women who were employed to create spools of copper wire. Hilda Ericsson was their boss. Her responsibility extended far beyond that, however. When Lars Magnus Ericsson was away on business-trips it was Hilda Ericsson who ran the whole enterprise, as when her husband attended the World’s Fair in Paris in 1889, which was the first electrified Fair, for example. By the 1890s the telephonic market had explosively expanded. The reason for this was the state had made it free to set up telephone companies as it was believed that the need was too limited to pose any threat to telegraphy. Over 500 telephone associations, companies, and cooperatives were very quickly established and every one of them required telephones. The same competition existed in Stockholm and it was Ericsson who produced the most telephones. A larger factory was opened at Thulegatan in order to meet the demand and when the 20,000th telephone had been produced there were almost 100 employees. In order to commemorate this an illustrated list of all the employees, including portraits, was compiled. Not a single woman was included, not even Hilda Ericsson’s name appears in any company documents. It is only in the private correspondence between Hilda and Lars that you find traces of Hilda Ericsson’s contributions to the company development. By the turn of the century 1900 Telefonaktiebolag L.M. Ericsson was a global company and Hilda Ericsson’s role began to diminish. In 1903 the Ericssons left the company altogether as by then they had amassed enough wealth that they could do whatever they liked. One of the things they did was to buy a farm at Alby near Stockholm, where they established and ran a model farm. This became a new family enterprise with Lars Magnus Ericsson as the innovator and Hilda Ericsson responsible for finances. Lars Magnus Ericsson died in 1926 and Hilda Ericsson died in 1941. She is buried beside her husband at Botkyrka cemetery. Hilda Carolina Ericsson, www.skbl.se/sv/artikel/HildaEricsson, Svenskt kvinnobiografiskt lexikon (article by Bodil Hasselgren), retrieved 2019-04-20.